THINK AND GROW RICH TODAY! Think and Grow Rich Today"
Many say Napoleon Hill's classic best-seller in the personal success field offers a life-altering experience. Over time it has taught thousands pactical steps to high achievement and financial mastery. Now, Craig Lack and other leaders from around the world take those same principles and present them in modern context to help you learn to achieve your greatest desires. Just as the original book by Napolean Hill did, this book - founded on many similar principles stands to become the next transformational guide for those who want to be healthy, wealthy, successful, and RICH. Bottom line... just like the original timeless best-seller by Hill, this book not only helps you to be more monetarily successful, it is really a down-to-earth guide about how to achieve anything in life. Napoleon Hill, in his renowned book, Think and Grow Rich, reinforced the message that people, and businesses, become trapped by their habits – either by lack of ambition, lack of specialized knowledge or lack of imagination. The proof of Napoleon Hill’s message can be seen repeatedly in businesses everywhere today. The authors of this book are undeniably among the world's leading experts in the Napolean Hill principles of "Think and Grow Rich". Craig Lack is proud to be involved in this collaborative effort with these fellow authors. Each one exemplifies leadership, compassion, devotion to service, and the lifelong pursuit of personal and professional excellence. If you like what you have read, take a moment to reach out to Craig to learn how he can help you or your real estate agent sell your home quicker and for the best price. 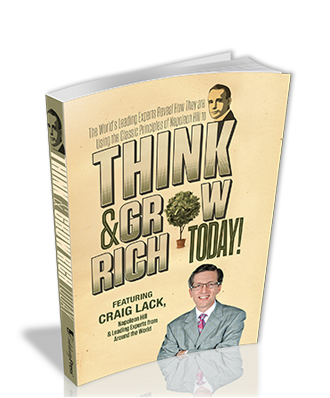 © 2013 Craig Lack | Think & Grow Rich Today!